1) What services does your office offer? 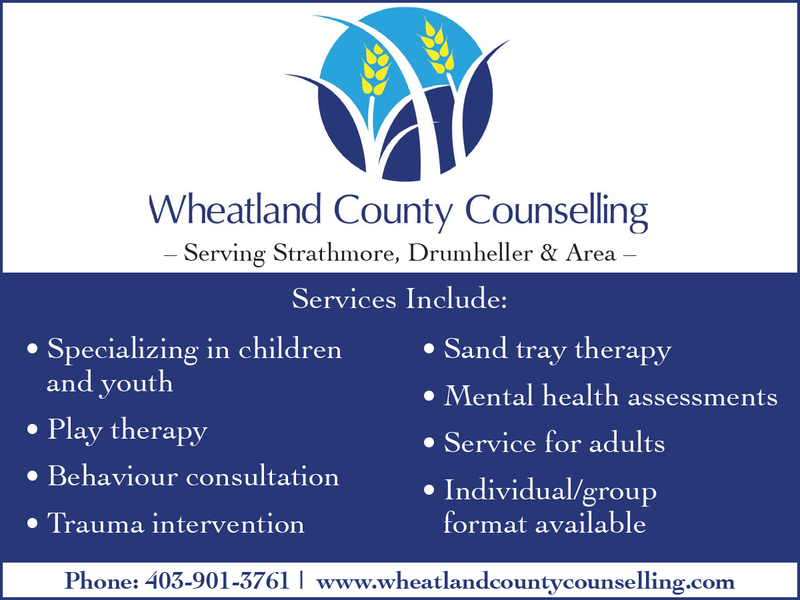 Wheatland County Counselling is a full service Psychology practice offering therapy to individuals, couples and families of all ages. The practice has a team of four therapists, each with unique training and experience. 2) Do you find people are hesitant to seek mental health treatments? The biggest barrier many face can be financial. Those without extended health benefits can see the cost of private therapy prohibitive. 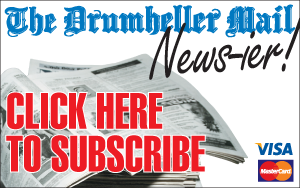 The Town of Drumheller offers a subsidy program to help those who may see this as a barrier. Additionally, stigma can be a barrier for many. 3) How important is Mental health for young people? Mental health is just as important, if not more important, in children as adults. Children do not have the cognitive capacity to identify, process, and at times, appropriately express emotions. Instead feelings can be internalized and children will complain of stomach aches, headaches, or become defiant or withdrawn. Childhood adjustment often carries through into adulthood, especially when concerns are not addressed; early intervention is key. A marker I often tell parents is that when a child’s sleep pattern changes or when their daily mood is drastically different than usual it may be worthwhile to have them seen. 4) When should somebody reach out for external help? Changes or disruptions to sleep, appetite, and daily mood are all markers for clinical levels of mental illness. If someone finds themselves struggling with stress, sleep or mood on more days than not, it may be worthwhile to seek support. 5) What can a person do to maintain their mental health? Through my training, I believe in a biopsychosocial approach to mental wellness. This means biological, psychological, and social aspects all interact to contribute to overall mental health. Biological factors include how a person eats, sleeps, their genetics, and how much exercise they get. Psychological aspects relate to a person’s thinking patterns, which for many of us, can become negative or develop unhealthy patterns (this is where therapy with someone appropriately trained can be incredibly helpful). Finally, social aspects of a person’s life will also contribute to mental wellness. This includes a person’s family life, life with friends, life at school or work, etc. Mental wellness comes from balance and health in each of these three areas. 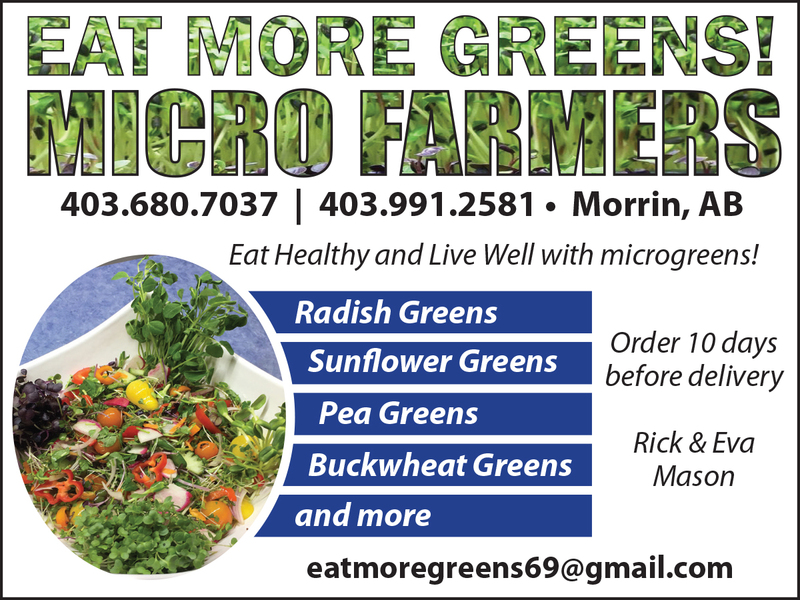 Rick Mason has known since the 90s the benefits of microgreens, but just in the last year he and his wife Eva have decided to start selling the produce which has been trending in foodie circles. Microgreens are not the produce we are familiar with in grocery stores. They are harvested just after sprouting as shoots. Since becoming well-known in restaurant circles in the 90s, the food has been growing in popularity recently for both its visual appeal and the nutritional benefits. The stuff is filled with antioxidants and is high in nutrients, with some reports saying up to 40 times as much as their full grown counterparts, and their potency allows them to be easily added to almost any dish. The couple grow radish greens, sunflower greens, pea shoots, and buckwheat and more in their home. 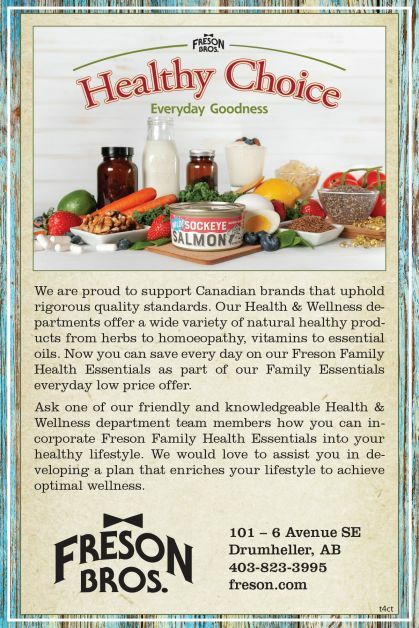 Rick and Eva currently sell their product out of their Morrin home and at a few restaurants, and people interested in buying some can contact them at 403-680-7037 or 403-991-2581. The couple plans to start selling their product at Drumheller farmer’s markets this year, where they plan to bring the growing plants directly and to cut them for customers right there.